RedLine Solutions, the leader in produce traceability and inventory solutions, announced today that it has included a new paperless picking function in its popular RedLine Cooler TM warehouse management software for grower-shippers. This new function eliminates the need for a printed pick list, which saves forklift drivers time going to the office to collect their next job. The system operates on rugged mobile computers, and increases picking speed and accuracy, optimizes stock rotation, and eliminates shipping errors by instantly validating each picked product against its associated order. The new option, called “Dispatch Loader,” avoids the need for a forklift driver to go to the office and receive their next order to pick. Now, the office can assign, and push an order directly to a particular driver’s mobile computer, which the driver can accept when they are free. The system can also queue available orders, and notify all drivers that new orders are waiting. Any driver can then accept a new order, on their mobile computer, and start working without the need for a printed picklist, which increases their productivity. “Dispatcher Loader” also allows multiple staff members to work on a single order. If the order is not completed for any reason, it can be returned to and finished later by another driver. The driver can also configure the system to display a list of the most suitable product for each order, saving time and assuring optimum stock rotation. Once the driver scans the selected pallet, the system rechecks that that pallet matches the order requirement, which ensures shipment accuracy. “Paperless picking with RedLine Cooler adds another layer of productivity for your shipping team. Your shipping office can now choose which orders are processed next and assign specific forklift drivers to a specific order. By eliminating the printed pick list, we save forklift drivers time spent going back and forth to the shipping office so they can ship more orders per day. 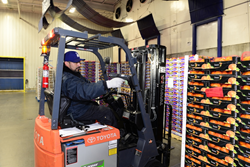 Management has visibility of each forklift driver’s activity levels, leading to greater accountability.” said Todd Baggett, CEO of Redline Solutions. RedLine Solutions develops practical whole chain traceability solutions for growers, packers, and shippers. RedLine has two decades of experience integrating traceability and inventory control software, with barcode, RFID and wireless technologies that increase the productivity, accuracy, and efficiency of their customer's operations. They work from the field, through the packing shed, cooler and shipping dock, as well as their clients FSMA (Food Safety Modernization Act) compliance needs.